Sick building syndrome (SBS) refers to a number of ailments that occur as a result of exposure to harmful chemical toxins at a home or work building. Symptoms of sick building syndrome can actually develop into a full-blown illness that is known to as building-related illness (BRI). To avoid suffering from BRI, it is important to be able to recognize the symptoms of Sick Building Syndrome and treat them quickly. 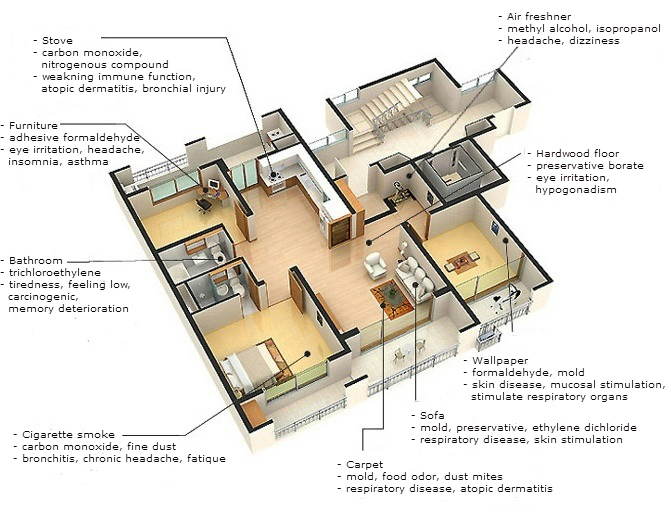 One of the most problematic issues related to sick building syndrome is that, because its symptoms often appear unrelated, it often goes misdiagnosed and untreated. It's up to you to recognize the symptoms. Sick Building Syndrome shows up as a set of ailments that flair up when you are in a specific building and generally pass after you leave the building. If you experience symptoms that are prolonged even beyond leaving the buildings, this may be an indication that you're suffering from the disease called Building Related Illness or BRI. the World Health Organization reported that the materials used in up to 30% of newly-built buildings may cause acute illness in individuals residing in them for long periods of time.³ That means that, all buildings were contaminated with harmful products! It is likely that this number will increase as the demand for housing rises.